The main part of your site is the content pages. These are where you will add all the text, documents, links and pictures that make up your site. 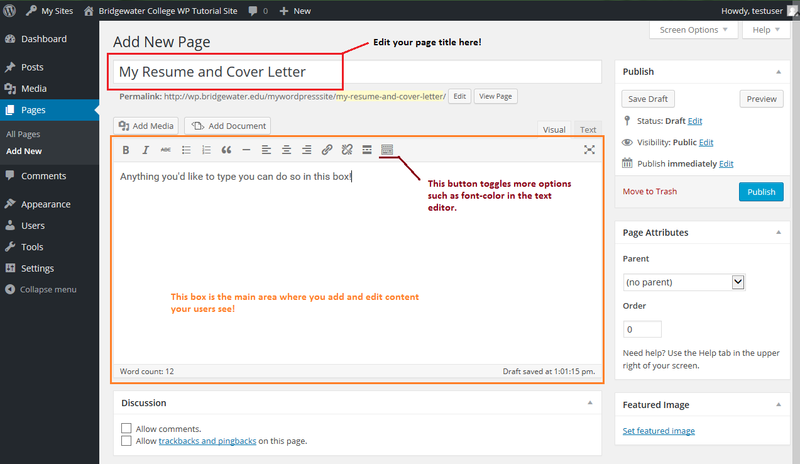 To create and edit content pages, click on the Pages option on the WordPress dashboard under Media. To add a new page to your website, click Add New at the top of the Pages management screen. If you want to edit an existing page, just click on the blue title of the page you want to edit. From the screen below, you can edit anything about the specific page you have selected, such as the title, the text on the page, and the ability to add images and documents to a page. The Pages editor is one of the most powerful tools you have in WordPress and allows you to create content-driven pages that meet your needs. You’ll have to use the editor to get the most out of your site. To add a header to the page, highlight the text you want to use and select the paragraph dropdown. This will allow you to create page headers that break up your site page. After adding four or more headers, a Table of Contents will appear at the top of your page. You can change the options to the TOC+ plugin to change the way it looks by following the tutorial here: (tutorial to come). 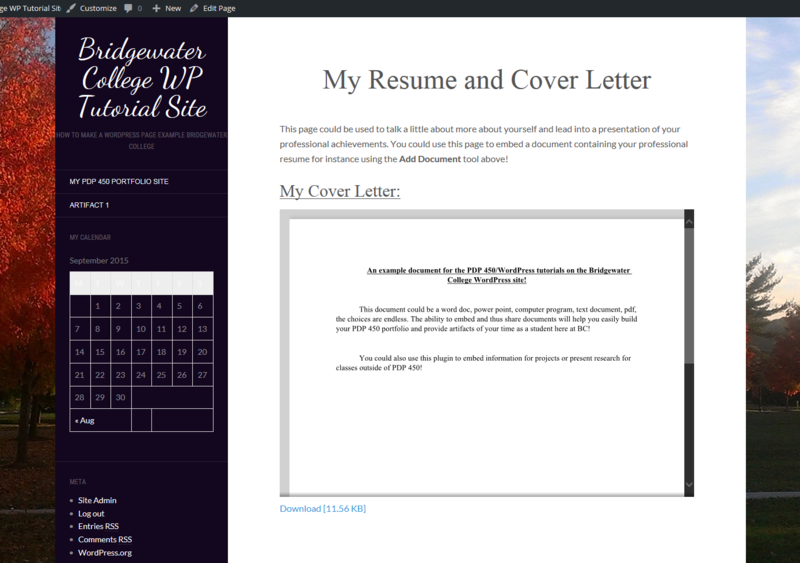 The last piece we’re going to add to this page is our actual cover letter. 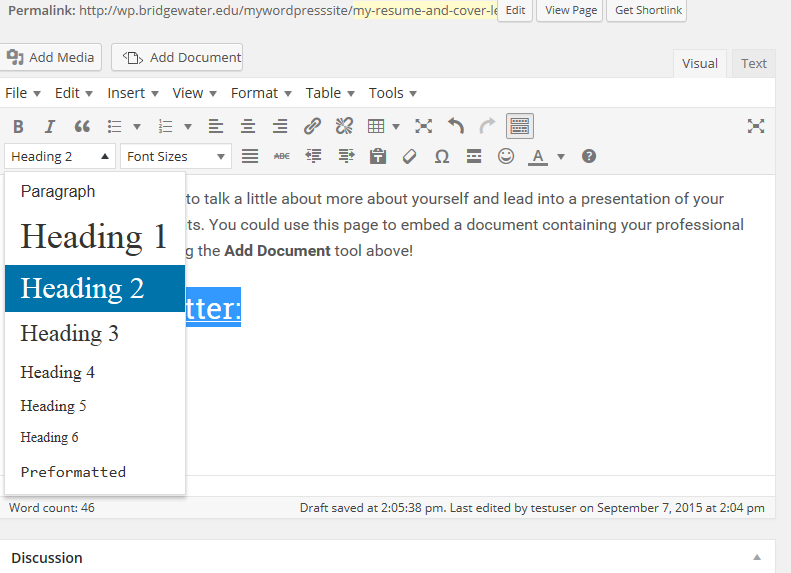 To embed the document, select Add Document at the top of the editor. We go in more detail on how to embed documents here: Embed Documents into Content Pages. Below the editor are a few other options that are important to the development of your site. Under Discussion , there are two checkboxes. The first one, Allow Comments, allows other users to post comments about a page you create once the box is checked. Don’t worry, you still have control over what appears on your site. Any time someone posts a comment on your site, only you can see it in the dashboard until you approve it for public view. After you Publish/Update your page and everything is saved, you can go view the site by clicking the View Page button at the top.